When I started this series on the Medici family writing about Cosimo de Medici, actually I didn’t realize how many Medici names had been used two or more times. If you look at the Medici family tree, you’ll find three Francesco de Medici and one Francesco Maria. Not to consider two Pier Francesco, that I included in the article about Piero de Medici. 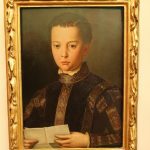 Also check out my articles on Giovanni de Medici, Lorenzo de Medici, Giuliano de Medici and Ferdinando de Medici. This is what you’re looking for, 99% of the times. 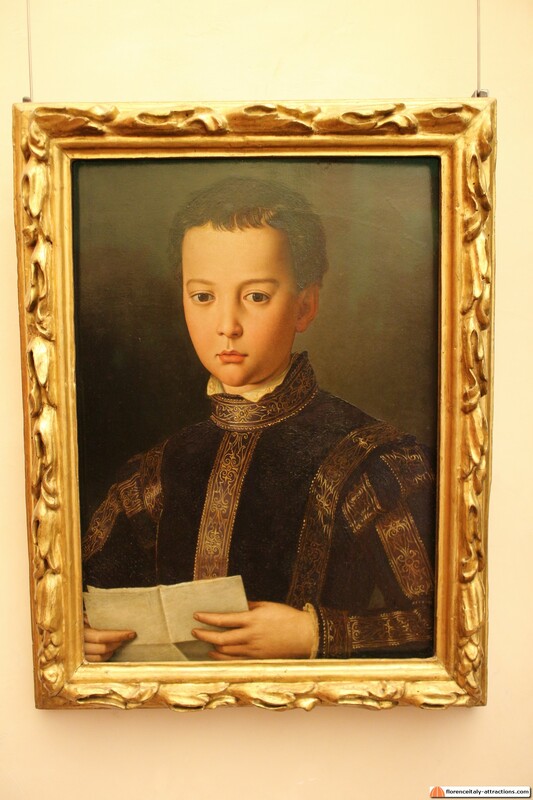 Francesco de Medici was the first son of Cosimo I Grand Duke of Tuscany, designated to become the next Grand Duke. He was born in 1541, one year after the Medici family moved from Palazzo Medici to Palazzo Vecchio. His father, just 22, had been Duke of Florence for 4 years already. In history, it’s hard to find two personalities as different as Cosimo and Francesco de Medici: Cosimo was a man who loved his position, fought to expand the possessions of Florence and the power of his family, and also loved to celebrate himself (just look at the ceiling of the Hall of the 500 in Palazzo Vecchio); Francesco was shy, sensible and intelligent, loved science and alchemy and considered his political duties like a burden. In 1565, Cosimo I combined a favorable wedding for his heir with Giovanna of Austria, daughter of Ferdinand I Holy Roman Emperor. This was the mundane event of the century in Florence, and led to the internal decoration of Palazzo Vecchio and to the construction of the Vasari Corridor. 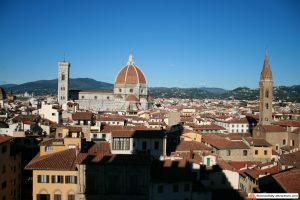 After the event, Cosimo I left Palazzo Vecchio and went to live in the Pitti Palace, in an attempt to leave more and more duties to Francesco and control his son. Francesco de Medici was crowned Grand Duke of Tuscany after the death of Cosimo I in 1574. His short reign as Grand Duke of Tuscany is remembered for some amazing work of art: the Studiolo di Francesco in Palazzo Vecchio, the Uffizi Tribune and the Buontalenti Grotto in the Boboli Gardens, just to make some examples. As you can notice, it’s all decorated rooms, where the Grand Duke could find some privacy and dedicate himself to study and reflexion. Francesco de Medici, again showing his personality, founded the Accademia della Crusca, an organization of scholars that still exists with the mission to preserve the Italian language. Francesco de Medici is most famous for his personal life: he had a secret lover, Bianca Cappello, a Venetian noblewoman who had escaped to Florence at the age of 15, after falling in love with a Florentine clerk. She lived in Piazza San Marco, and Francesco de Medici, married already, fell in love with her. 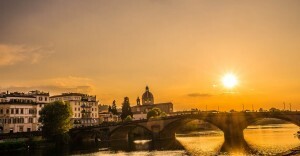 Bianca’s husband, Pietro Bonaventuri, was not so angry for this: he received a position at the court of the Medici and had many women to seduce, but in 1574 he was killed in the streets of Florence, probably for a love affair and there is some speculation that Francesco de Medici was involved. In 1576, Francesco and Bianca had a children, Antonio de Medici, and In 1578, the Grand Duchesse Giovanna of Austria died. Francesco de Medici secretly married Bianca, against the will of his own family. The marriage was officially announced in 1579 and Bianca was proclaimed Grand Duchesse, despite the opposition of Francesco’s family, especially Cardinal Ferdinando who didn’t forgive his brother. And here comes the mystery surrounding the death of Francesco de Medici and Bianca Cappello: they died on October 19th and 20th of 1587; after reconciling with Ferdinando, they had dinner together in the Medici Villa of Poggio a Caiano. The Grand Duke and his wife got ill after the dinner and died in few days. Ferdinando de Medici performed the autopsy himself, resulting in death caused by malaria, but there are legitimate suspects that the food was poisoned by Ferdinando himself. 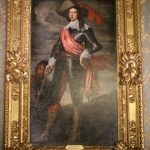 Francesco didn’t have any heir, his son Antonio was still considered illegitimate by the Medici family, even though the second wife Bianca had been proclaimed Grand Duchesse, so Ferdinando became Grand Duke of Tuscany. Medical analisys was performed twice on the remains of Francesco de Medici, without a conclusive result. Evidence of malaria were found but also traces of arsenic: we also have to consider that Francesco, being an alchemist himself, probably used arsenic as a medicine, obtaining the opposite effect. Francesco I Grand Duke of Tuscany is buried in the Medici Chapel, in a tomb which is smaller than the other Grand Dukes. Ferdinando probably didn’t poison his food, but certainly didn’t care a lot to honor the memory of the brother. Francesco de Medici (1594-1614): well at least Ferdinando I de Medici honored the memory of his brother naming his second son after him. Francesco di Ferdinando de Medici had to become an ambassador, but he preferred a military career. He was commanding the troops sent by Tuscany in 1613 to help the Duke of Mantua Ferdinando Gonzaga (Francesco’s brother-in-law) in a fight agaist the Duke of Savoy, but an agreement was reached before Francesco de Medici started the fight. So he went in pilgrimage to Loreto, and died immediately after, at the age of 20. In his short life Francesco de Medici obtained many titles: Prince of Capestrano, Baron of Carapelle and Lord of Ofena. Francesco de Medici (1614-1634): We don’t have many news on the fourth son of Cosimo II Grand Duke of Tuscany and Maria Maddalena of Austria. He had a military career participating in some battles during the thirty years war, together with his brother Mattias, one year older. His brother Ferdinando II Grand Duke of Tuscany had a very good relationship with his brothers and allowed them to participate in the government of Tuscany. Francesco de Medici died at 20, killed by the black plague during the siege of Ratisbon. 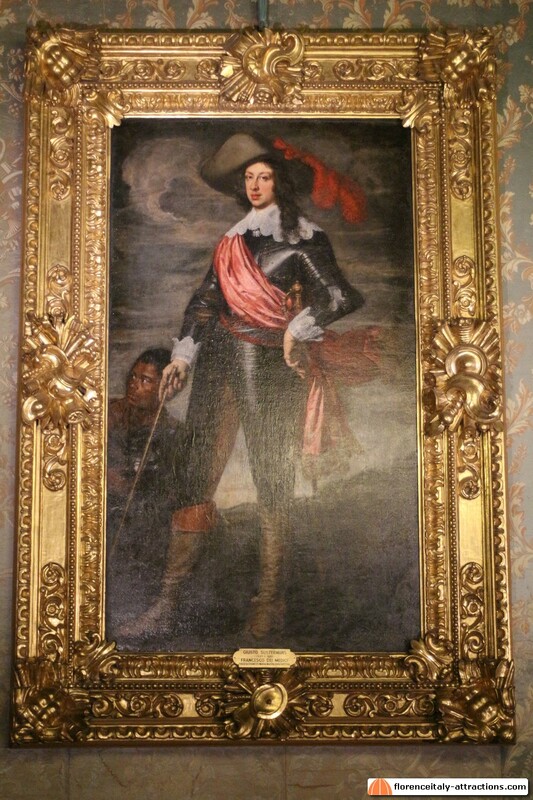 We have a portrait of Francesco de Medici by Justus Sustermans in the Royal Apartments of the Pitti Palace. I don’t know if it’s the painter’s style, but Francesco and his brother the Grand Duke Ferdinando II look like twins! Francesco Maria de Medici (1660-1711): second son of Ferdinando II Grand Duke of Tuscany and Vittoria della Rovere, Francesco Maria de Medici was named Governor of Siena in 1683 and Cardinal of the Catholic Church in 1686. During his life he obtained many titles and decorations, but never lived in Rome, preferring the Medici Villa of Lappeggi, close to Florence, where he had his personal entourage and hosted many parties. In the meantime, the Medici dynasty was dying out. The older brother of Francesco Maria, Cosimo III Grand Duke of Tuscany, was desperate at finding a solution, but nor his first or second son had children. In a desperate, tragicomic attempt to solve the issue, Cosimo forced Francesco Maria (aged 49 and in bad health conditions) to marry Eleonora Gonzaga. Francesco Maria died shortly after, without giving any heir to the dynasty. Francesco Maria de Medici is represented in a fresco by Luca Giordano in Palazzo Medici Riccardi, commissioned by the Riccardi family after buying the historical residence from the Grand Duke Cosimo III.